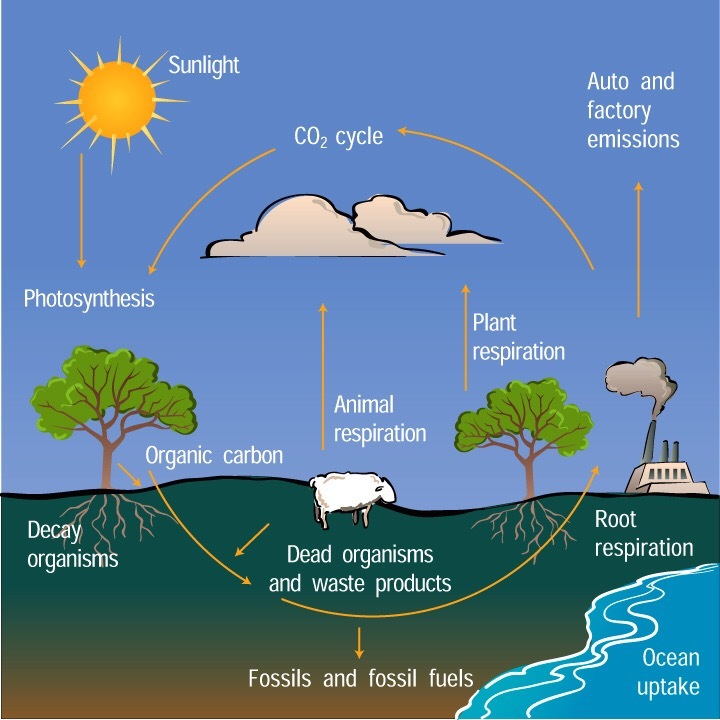 We’ll get back to tiny and small houses in a bit, but I wanted to touch base on a topic that I think we might need a refresher on: the carbon cycle. Like water, which is also necessary for life, carbon circulates throughout our world in a cycle. The earth has designed itself to work with all sorts of chemicals in all states, all over the place. Over 3+ billion years the planet has really refined its processes to not only support life but also keep everything in balance. Short of a meteor hitting the planet, nothing really can upset our happy little world. It takes thousands and millions of years for things to change, evolve, adapt…however you want to describe it. Then humans came along and after a couple hundred thousand years we figured out how to change the natural systems of the planet, for no particular reason other than as a result of our need to make things easier for us. The carbon cycle is the latest thing we’ve messed up, with catastrophic ramifications for essentially every living thing on the planet. All living things are made of carbon. Carbon is also a part of the ocean, air, and even rocks. Because the Earth is a dynamic place, carbon does not stay still. It is on the move! Plants use carbon dioxide and sunlight to make their own food and grow. The carbon becomes part of the plant. Plants that die and are buried may turn into fossil fuels made of carbon like coal and oil over millions of years. When humans burn fossil fuels, most of the carbon quickly enters the atmosphere as carbon dioxide. Carbon dioxide is a greenhouse gas and traps heat in the atmosphere. Without it and other greenhouse gases, Earth would be a frozen world. But humans have burned so much fuel that there is about 30% more carbon dioxide in the air today than there was about 150 years ago, and Earth is becoming a warmer place. In fact, ice cores show us that there is now more carbon dioxide in the atmosphere than there has been in the last 420,000 years. Messing up the carbon cycle also makes a LOT more work for all of us. And with more work comes more cost. To think, we were trying to make life easier for us. We like to mine and drill for coal, gas and oil and simply burn it because it is (erroneously) considered cheap energy. But doing so releases too much carbon into a system not designed to handle it which means we get whacky weather that costs economies around the world untold dollars in the form of property damage, lost productivity, healthcare costs, migration, refugee creation, on and on the list goes. We are socially adverse to stop burning fossil fuels because we’ve been trained to only look at jobs today, and cost on a monthly fuel bill or at the pump. How often do you hear relatives debating the latest gasoline prices vs the last time they debated the life cycle costs of owning an automobile or home run on fossil fuels? The fossil fuel economy has tons of hidden costs and we’ve all been schooled to keep them hidden. It is ironic that in a society that abhors social welfare programs, the very foundation of our fossil fuel addiction, which is killing us is in fact riddled with welfare in the form of these hidden costs. Fossil fuels make all of our lives more difficult and more costly. There is a better way. The sun (and earth) provides us with free energy just like free fossil fuels do. And we don’t have to dig underground for it necessarily (or at least we only need mine for the useful metals and elements needed to harvest solar power or mine geothermal wells). The biggest argument against renewable energy is that it costs too much and we can’t power everyone on it. Well let me tell you what, it doesn’t cost too much, we can power everything on renewables, and we have no choice if we want to live. So we need to rethink how we assess cost and value, and we need to rethink the possibilities here. More solar energy hits the surface of the planet daily than we could imagine using in a year. We need to work smarter and not harder. Using renewable energy is like using your income instead of your savings to pay your bills. It’s simply responsible management of resources. Renewables also are more transparent when it comes to life cycle costs. You have the sun, the power generator and the consumer. There are no ill effects born by those who’s interests are not reperesented like you get with coal, oil and gas. When people have medical expenses due to poor air quality, the coal companies and users don’t get their medical bills. When sea levels rise and hurricanes increase due to the burning of oil, the oil rig workers, and Wall Street tycoons don’t get the bill for rebuilding entire communities and higher insurance premiums. When habitats are ruined so that future generations can’t use them, the gas company doesn’t get a bill to pay for that. Also fossil fuels are finite, so every barrel you burn is a barrel that won’t be available for our children to use; it’s not like mining for aluminum or gold that can be recycled. There is no honor in tearing down a mountain just to burn what a machine mines in order to run my XBox for an afternoon. Renewable energy use gets the carbon cycle back on track, and is the most fair, cheapest and democratic manner in which to power our world. The switch to renewables also creates a second industrial revolution which will power our economy for the next hundred years as we educate and tool up our workforce in a manner that hasn’t been seen since the middle of the last century. Switching to renewables puts more people to work, and reduces our need for intrusive regulation. I have no problem getting personal and saying when you argue against renewable energy you really show how little you know or how little regard you have for people, planet, and even profit. I think deep down we all care, or we should care, so educate yourself if you don’t know. I have a lot to learn as well too. And I still fill up my SUV’s with gasoline. But I am making every effort I can to improve and live the right way, hopefully someday without the need for fossil fuel welfare. The number one thing we can do is be informed consumers. Understand the ramifications of our actions and decide what we want to support with our dollars and effort. Stop supporting those who deny climate change, and do not remain silent or turn a blind eye regarding how we should be fueling our world with renewables. Silence is complicity. I will not be silent, I will not abide the status quo. You shouldn’t either.